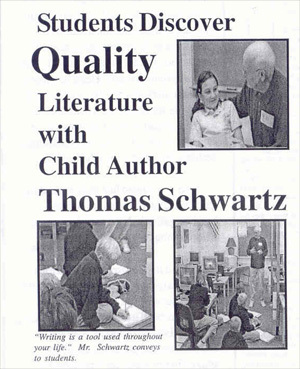 Recently Tom Schwartz discussed writing with students at the R. L. Stevenson School of the Arts. Tom had a lot to offer the students, and will be helping to present awards at the school's Discovering Quality Literature Writers' Fair in May 2006. Tom's new book, How Mother Nature Flowered the Fields, is featured above. Tom is a guest speaker at the elementary schools in central Florida, and has been to over 60 schools speaking to 2nd through 5th grade students (about 18,000 of them, so far). 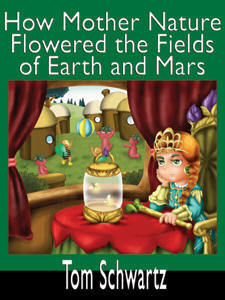 The book, "How Mother Nature Flowered the Fields of Earth and Mars," is included in the elementary school's Renaissance Learning Accelerated Reader Program. Tom was born in December 1930, in Brooklyn, NY where he attended Public Schools including the Manhattan H S of Aviation Trades. In 1951 he enlisted in the Navy and won a “Fleet” appointment to the Naval Academy in Annapolis, Maryland. Upon graduation, he served in the US Air Force where he spent most of his 27 years in the Research and Development area. After retiring from the Air Force as a Lt. Col., he worked for Computer Sciences Corporation (CSC) as a Program Manager. He now resides in Melbourne, Florida, where he continues to work for CSC part time, and enjoys writing nature stories for children. 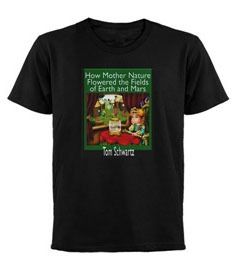 Get your t-shirts, hoodies, tank tops, posters, greeting cards, and more featuring artwork from the How Mother Nature stories by Tom Schwartz. (c) 2000-2006 RP Books. All Rights Reserved.